Nathan Phillips, right, Native American from Ypsilanti, Michigan, and Covington Catholic High School students in Washington, D.C. Jan. 18th, 2019. Screenshot From Video Posted On Twitter by NC Noland. 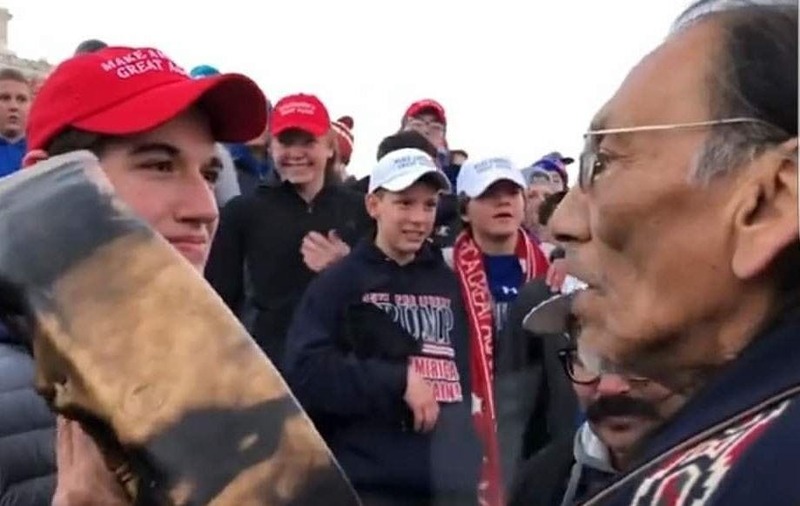 A Twitter video showing Nathan Philips, a Native American military veteran of Ypsilanti, Michigan, and a group of Covington Catholic High School students in Washington D.C., Jan. 18, 2019, has created quite a stir. The video began circulating on Jan. 18 and quickly gained national attention. The Roman Catholic Diocese of Covington confirmed the students were from Covington Catholic High School in Kentucky in a press statement published last week. Phillips said to NBC News, “That I do not know whether the boy in the video should be expelled from school, but the trip's chaperones should be fired. How did they allow these students to come to this point? Were they with them? Who was encouraging them?" Many comments on social media suggest people believe the high school students were encouraged to chant, "build that wall," by President Donald Trump’s “Build the Wall” and “Make America Great Again” campaign slogans, which could be seen on the students’ shirts, sweatshirts and hats. This is not confirmed by the students, school or archdiocese. Phillips stated to Fox 2 News of Detroit, "It's like we need somebody to blame for our failings, maybe our President is kind of ... feeding the fires of racism. Especially the building of the wall. Why do we have to build a wall on the southern border and not the northern border?" Representative Debra Haaland, the first Native American woman elected to Congress, stated, "These young kids should be taught to respect their elders, that they're important. People, they're getting so bold with what they're saying and doing." The March for Life took place at the same time and place as the Indigenous Peoples March. The Covington Catholic website and social media shows that students and faculty attended a separate rally. After the video went viral on social media, the school’s Twitter account was made private, not allowing people to view the account. The school has received many phone calls and emails about the incident. As of Jan. 18, the school has elected to disconnect its phone line. People on social media have claimed to have found the email addresses to the Covington Catholic High School principal and for the Archdiocese of Kentucky. Nick Sandman, a Covington Catholic High School student at the event, in an interview with Savannah Guthrie on NBC's The Today Show, said he asked permission to start the school in a chant at the March for Life rally while waiting for the buses. The students were not directing the chant at Phillips.